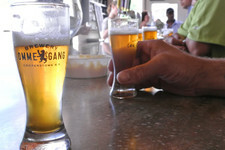 This year's Belgium Comes to Cooperstown festival at Brewery Ommegang is set for August 5-6. Tickets go on sale this Friday, April 1 at noon and they usually sell out very quickly : "Please note that VIP tickets have sold out in under a minute for the last four years and historically, all tickets sell out within a day of the event going on sale." ...3,000 lucky guests will enjoy the opportunity to taste hard-to-find Belgian import brews as well as Belgian-style ales from all over North America. More than 100 breweries will be on-hand pouring while festival-goers fully immerse themselves in a wild and wonderful space fueled by the legendary actor's best known movies and characters. Tickets go on sale to the public April 1. As always, BCTC promises more than just great beer - gourmet food vendors, live music, on-site camping and fireworks make the weekend truly special. And of course, surprises! The entire event will be designed to emulate the creativity and spirit of Bill Murray, and what could be more Murray-like than an "anything is possible" attitude and expectation. The brewery will also be open for breakfast that Sunday. General admission tickets for Saturday's tasting are $110 ($125 with camping). There's also a $50 designated driver ticket. VIP tickets -- which include a beer dinner that Friday night, two nights of campus, and early access -- are $275. Me and my buddy's went the first 2 years this festival was held and it was absolutely fantastic. Now it is such a hassle to get tickets I refuse to even attempt to try and go to this festival. Just following up on this - you weren't kidding about the VIP tix selling out instantaneously! Etix went from ~ not on sale yet ~ to ~ no tickets available ~ literally in the second that it took to refresh the screen! There still are some GA tix, and GA tix with camping available though.